AIMS To investigate patterns of infant growth that may influence the risk of sudden infant death syndrome (SIDS). DESIGN Three year population based case control study with parental interviews for each death and four age matched controls. Growth was measured from prospective weight observations using the British 1990 Growth Reference. SETTING Five regions in England (population greater than 17 million, more than 470 000 live births over three years). SUBJECTS 247 SIDS cases and 1110 controls. RESULTS The growth rate from birth to the final weight observation was significantly poorer among the SIDS infants despite controlling for potential confounders (SIDS mean change in weight z score (δzw) = −0.38 (SD 1.40)v controls = +0.22 (SD 1.10), multivariate: p < 0.0001). Weight gain was poorer among SIDS infants with a normal birth weight (above the 16th centile: odds ratio (OR) = 1.75, 95% confidence interval (CI) 1.48–2.07, p < 0.0001) than for those with lower birth weight (OR = 1.09, 95% CI 0.61–1.95, p = 0.76). There was no evidence of increased growth retardation before death. CONCLUSIONS Poor postnatal weight gain was independently associated with an increased risk of SIDS and could be identified at the routine six week assessment. Epidemiological studies have shown that low birth weight or short gestation in relation to the risk of sudden infant death syndrome (SIDS) both before and after the “Back to Sleep” campaign are important characteristics of SIDS infants. However, fewer studies have looked at the continuation of this vulnerability in terms of infant growth. The results of studies that have investigated growth patterns in relation to the risk of SIDS are conflicting. Five studies1-5 found that SIDS infants gained weight more slowly with increased retardation prior to death, while four studies6-9 concluded that there were no differences in growth rates. Some of the earlier studies suffered from recruitment or sample bias and lacked the multivariate techniques to put their findings into context, and none of these studies took account of conditional weight gain in terms of regression towards the mean (infants with lower birth weight tend to grow faster, while larger infants grow more slowly). The recent development of conditional reference charts10to assess weight gain in infants (the British 1990 Growth Reference), comparing current weight with that predicted from previous weight and allowing for regression towards the mean, have allowed us to reassess this issue. These charts, based on 223 Cambridge infants and validated on 727 infants from the Newcastle Health District, are standardised for comparison within different gender and gestational age groups. The resultant score summarises how the child's weight gain over a period of time compares with the gain expected for a child of the same initial weight, measured at the same two ages. The study of Sudden Unexpected Deaths in Infancy (part of the Confidential Enquiry into Stillbirths and Deaths in Infancy: CESDI SUDI study) was designed to elicit detailed information on the epidemiology and current risk factors associated with SIDS after the “Back to Sleep” campaign and subsequent fall in rates. As part of the study, prospectively recorded weight observations were collected from parent held records for SIDS and age matched control infants. One of the aims was to investigate patterns of infant growth and how these patterns and contributory factors might be associated with the risk of SIDS. The methodology of the CESDI SUDI study has been described previously.11 12 Briefly, it was a large population based case control study conducted over a three year period from 1993 to 1996. The study aimed to include all sudden unexpected deaths of infants aged 7 to 364 days from a total study population of 17.7 million. Data were collected on a standard questionnaire by research interviewers and from parent held and medical records. Bereaved families were visited within days of the death for a narrative account and a second visit within two weeks to complete the questionnaire. Four age matched control infants for each case were selected. The interviewer visited each control family within a week of the death to collect the same data as for the index case. A period of sleep (the “reference sleep”) was identified in the control infant's life in the 24 hours before the interview corresponding to the time of day during which the index baby had died. All community, primary care, hospital, and parent held medical records were collected and photocopied, for infants who died and for the controls. The minimum data required to utilise the British 1990 Growth Reference consist of two live weight observations at least four weeks apart, together with the ages when measured, gestational age, and gender of the infant (weights after the death were not used). The number of infants included in different parts of the analyses varied according to the number of weight measurements required for each particular analysis as detailed below. To assess whether growth patterns at the time of the routine six week check are of value in predicting the risk of SIDS, a subset of the infants in subgroup (1) was chosen, for whom a weight measurement had been recorded between five and seven weeks after birth. The weights and age at observation were converted to standard units (weight in g, age in days from birth) and transcribed from the parent held records to an Excel spreadsheet. Using the British 1990 Growth Reference, both estimates of weight at a particular point in time (taking into account gestational age and gender) and change in weight over time (also conditional on previous weight and taking into account regression towards the mean) were converted to z scores (a z score is defined as the number of standard deviations by which a measurement differs from the population mean). Z scores should be normally distributed with a mean of zero and a standard deviation (SD) of one (equivalent to a mean on the 50th centile with two thirds of the observations falling between the 16th and 84th centile). For the point estimate z scores, a positive value implies a weight measurement above the mean and a negative value one below the mean. For changes in z score over time (δzw) a positive value denotes weight gain faster than normal between two point estimates and a negative value denotes weight gain slower than normal. In the three year period there were 470 000 live births in the study areas, and 456 sudden unexpected deaths in infancy (SUDI) of which 363 were classified as SIDS. Of the 363 SIDS families, 24 refused an interview (93.4% consent rate); 14 other families were excluded from the analysis because of police involvement (suspected non-accidental injury), because they lived outside the study regions, or because they could not be traced. Of the 1452 control families required, 37 refused to take part (97.5% consent rate); a further 77 (5.3%) could not be contacted or were unsuitable because of recent illness or bereavement. Each excluded control family was immediately replaced (with the baby next closest in age on the same health visitor's case load), yielding 325 SIDS cases and 1300 controls. For all 325 SIDS infants and 1292 controls (99.4%), data on birth weight, gender, and gestational age were collected. The average birth weight for SIDS infants (mean 2974 g (SD 725 g), median 3053 g (IQR 2575–3458g)) was lower than the controls (mean 3375 g (SD 539 g), median 3399 g (IQR 3080–3692 g)). This difference (mean 401 g, median 346 g) was significant (p < 0.0001). There were more boys among the SIDS infants than controls (63.1% v 51.7%, OR = 1.66 (1.26–2.17), p = 0.0003) and the gestational age was significantly shorter (SIDS: median 38 weeks 1 day (IQR 36 weeks 4 days to 39 weeks 3 days); controls: median 39 weeks 1 day (IQR 38 weeks 1 day to 39 weeks 6 days); OR per week difference = 1.28 (1.20–1.36), p < 0.0001). The birth weight z score distribution for the control infants was approximately bell shaped with a mean around zero (+0.07) and a standard deviation around one (0.99), compared to a much flatter peak and leftward shift among the SIDS infants with a mean of −0.22 and standard deviation also around one (1.02). These distributions were significantly different (OR per z score unit difference = 1.35 (1.17–1.56), p < 0.0001). Table 1 shows the baseline data for the four subgroups being analysed. For both cases and controls in each of the four subgroups, the variance of the birth centile was around one, and the mean centile only varied between the 51st and 53rd centile among the controls and between the 38th and 42nd centile for the SIDS infants. The number of weight observations per infant (including birth weight) was slightly higher among the controls. 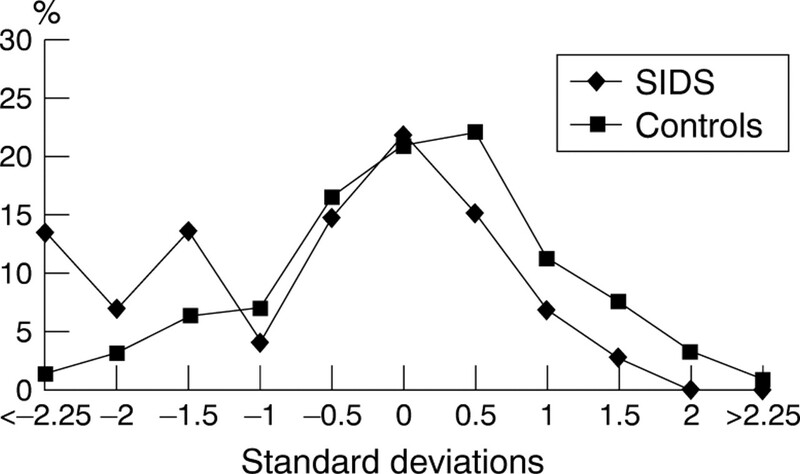 There was no significant correlation (using subgroup (1)) between the number of observations and the pattern of growth (correlation coefficient −0.09, p = 0.74). The median time from death of the index infant to interview of the control families was 11 days (IQR 9–12 days). The age of the control infant was taken as the age at reference sleep in the 24 hours prior to interview. Therefore, because of the time lag in arranging control interviews, the control infants were slightly older than the index infants. This difference was reflected in the time periods between weight recordings and taken into account for each analysis. The mean z scores for the last recorded weight were lower than those for birth weight among the SIDS infants and higher among the controls, a difference that was highly significant (table 2). Figure 1compares the distribution of change in z score (δzw) from birth to the last observation. The SIDS infants grew significantly less well than the controls. For SIDS and control infants with birth weights below the 16th centile there was little difference in the mean of the last observed weight or the change in z score (δzw). The differences between SIDS and control infants for both last observed weight and the conditional growth distribution from birth stemmed mainly from those with birth weights on or above the 16th centile. Subgroup (1): distribution of change in z score (δzw) from birth to the last observed weight. n = 247 (SIDS); n = 1110 (controls). Using this dichotomy of birth centile, differences in the mode of feeding were also observed (table 3). In the first two weeks of life, solely bottle feeding was more common among the SIDS infants, solely breastfeeding was more common among the controls, while the proportion of SIDS and control infants fed on both was similar. However, splitting the data by birth centile, these differences were much less pronounced among those infants with birth weights below the 16th centile. This stems not from any change in feeding pattern among the control infants but from an increased proportion of low birth weight SIDS infants solely feeding on the breast. Table 4 shows both the univariate and multivariate risk associated with each downward change of growth by one unit of standard deviation. Although the numbers are small, the risk associated with a downward change of z score greater than two standard deviations is greatly increased. A downward shift of any magnitude is significant and remains significant when controlled for potential confounders. The risks associated with poor growth and low birth centile both remained significant in the multivariate model. For 119 SIDS infants and 531 controls, weight was recorded within two weeks of death (interview of controls). Compared to the mean weight z scores at birth, the z scores prior to death were lower for the SIDS infants and higher for the control infants prior to interview. Figure 2shows the corresponding change in z score (δzw) distribution. The differences observed in table 2 both between SIDS and controls, and between infants born small or larger, are similar when restricting the weight observations to those close to death or reference sleep (table5). Subgroup (2): distribution of change in z score (δzw) from birth to the last weight observation within two weeks of death/interview. n = 119 (SIDS); n = 531 (controls). A downward change in z score (δzw) of more than one may be considered a marker of poor weight gain. Table 6 compares the prevalence of potential confounders by case control and weight gain status for infants with poor or normal weight gain. Many of the confounders were more prevalent among the SIDS infants, particularly those with poor weight gain. The effect of each individual confounder on change in z score (δzw) was minimal with the exception of those infants admitted to a special care baby unit (SCBU), the most common reason for which was prematurity. Controlling for all the confounders, change in z score (δzw) remained significant (OR = 1.89 (1.15–3.08), p = 0.01). For 73 SIDS infants and 320 controls, data were available for birth weight, the penultimate observation (at least four weeks after birth and four weeks before the last observation), and the final observation within two weeks of death. Figures 3 and 4 compare the change in z score (δzw) distribution from birth to penultimate observations and from penultimate to the final observations for the SIDS and control infants. For the SIDS infants both distributions are shifted towards a negative change, suggesting poorer weight gain in SIDS for both time periods. 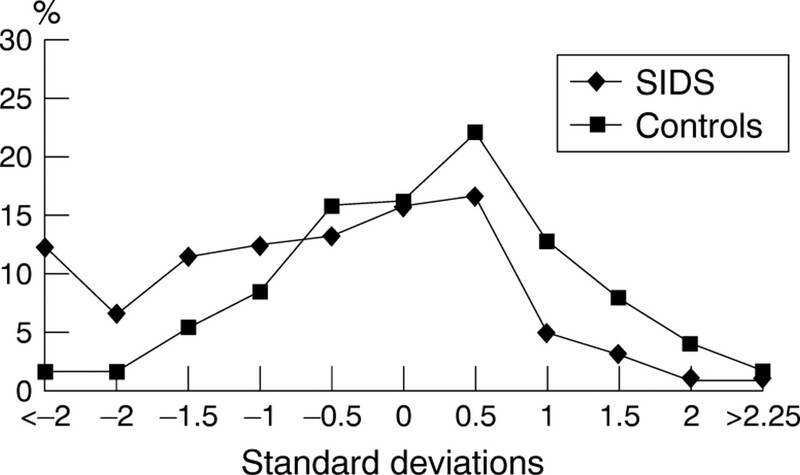 Controlling for infant age between the observations and the number of observations per infant, the risk associated with change in z score (δzw) from birth to penultimate weight (OR per z score unit = 1.69 (1.17–2.43), p = 0.005) was comparable to that from penultimate to final observation (OR per z score unit = 1.46 (1.04–2.06), p = 0.03). 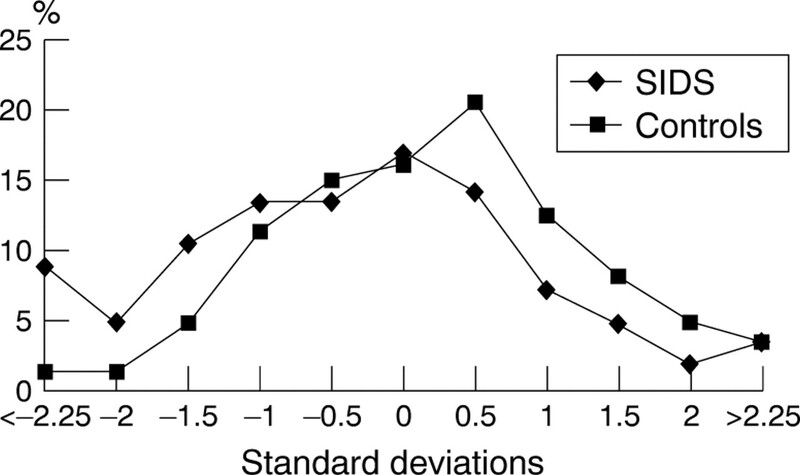 Putting both variables in the same model, change in z score (δzw) from birth to penultimate observation remained significant (OR per z score unit = 1.60 (1.11–2.31), p = 0.02) while the change in z score (δzw) from penultimate to final observation did not (OR per z score unit = 1.35 (0.94–1.93), p = 0.11). Subgroup (3): distribution of change in z score (δzw) from birth to the penultimate weight observation. n = 73 (SIDS); n = 320 (controls). Subgroup (3): distribution of change in z score (δzw) from the penultimate to last weight observation within two weeks of death/interview. n = 73 (SIDS); n = 320 (controls). For 170 SIDS infants and 861 controls, weight was reported at birth and between five and seven weeks after birth (only four SIDS deaths occurred in this study prior to five weeks of age). The lower point estimate of weight and poor weight gain of SIDS infants compared to the controls could be clearly identified and was significant over this shorter period (table 7). As before, the difference was only significant for infants with birth weights above the 16th centile. Extreme poor growth defined as less than two standard deviations (approximating to the 2nd centile) identified 11.3% SIDS infants compared to 1.8% controls. The relative ratio between these two proportions decreased when higher centile cut off points were chosen (5th centile: 17.4% SIDS v 4.0% controls; 10th centile: 24.3% SIDS v 7.5% controls). An accumulation of factors appears to render certain infants vulnerable to SIDS. A birth weight for gestation on the lower centiles (suggesting poor intrauterine growth) is one such factor; our results show that poor postnatal weight gain is independently associated with an increased risk of SIDS, but show an interaction with birth weight. Those SIDS infants with birth weights below the 16th centile show the least evidence of poor postnatal growth. Poor weight gain emerged strongly as a risk factor only for those babies with birth weights above the 16th centile. This subtle relation suggests both an independent prenatal and postnatal risk and may explain the conflicting results of previous studies. Breastfeeding in the first few weeks of life was more common among the controls and more common among SIDS infants with birth weights below the 16th centile than those SIDS infants with birth weight above it. 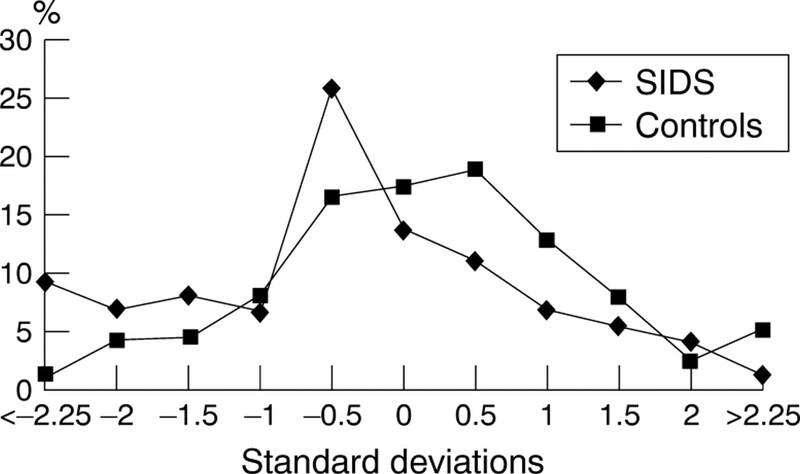 The mode of feeding did not explain the differences observed in weight gain between the SIDS infants and controls in the multivariate model but may partially explain the differences in weight gain between SIDS infants born with different birth weights. SIDS infants with the poorest growth tended to be those with a shorter gestational age, those admitted to SCBU, those of twins or triplets, those with poor health, and those with younger mothers and families of lower socioeconomic status, yet despite this partial confounding poor growth remained significant in a multivariate analysis in which account was taken of all these factors. Evidence of growth faltering in the weeks before death was not apparent in our data. In the same infants, the poorer weight gain among SIDS than controls was relatively similar when considering the time from birth to the penultimate weight measurement and from the penultimate to final measurement before death. Both the differences in growth between SIDS and controls and the relation to birth weight centiles were evident at an early age when measuring weight gain from birth to six weeks. Thus calculation of change in z score (δzw) for weight observations at the routine six week assessment of infants may be of value in identifying a group at increased risk of adverse outcome or death who might not have been identifiable at birth. The data from this study suggest for instance that extreme poor growth defined as a downward shift of more than two standard deviations (approximately the 2nd centile) in the first six weeks of life would identify more than 11% of SIDS infants in less than 2% of the population. Previous studies have tried to assess the impact of growth at postmortem examination. Some of these investigations have found evidence to suggest a retardation of growth velocity at the costochondral junction preceding death,17 and between internal organs and external measurements.18 This differential in growth rate was most apparent between 2 to 3 months of age. In contrast, another study19 found that brain weight and body length were greater for SIDS babies compared to their controls. Important though these observations are, body weights taken after death are unreliable (depending on time of examination, type of storage, and fluid loss) and finding appropriate control data remains a constant problem for all autopsy studies. As with any retrospective analysis of data from routine records there are certain limitations in our data. We had no way of checking the accuracy of the measurements used, although there was no reason to suspect a systematic bias between the cases and controls. More importantly we had no influence over when the measurements were made, which forced us to make a number of compromises in terms of defining small enough windows for measurements at comparable ages while preserving large enough subgroups for meaningful analysis. The limited availability of sequential observations from birth to shortly before death restricted the analysis to a third of the potential data set, while including observations from birth to last known weight increased the numbers but captured some infants for whom the last known measurement was several weeks before death. However, there did not appear to be a relation between the pattern of infant growth and the number of observations made, and the effect of using observations that do not adequately cover the lifespan of the infant will have been to reduce the estimate of the relative contribution of poor weight gain to the increased risk of SIDS in the multivariate analysis. Moreover, the distribution of weight gain among the different subgroups of control infants, reflected the same findings as shown by the British 1990 Growth Reference on two other normal populations, consistently showing a mean change in z scores (δzw) around or just above zero with a standard deviation of one, while among the SIDS infants, the point estimates of weight at different time periods and associated distribution of weight gain had the same strength and direction regardless of which subgroups were used. Measurements of postnatal growth are difficult both to collect and analyse. Routinely collected observations on head circumference and body length in infant populations are sparse. Although infant weight is recorded more commonly, the frequency and accuracy of measurement varies widely. Even if frequent measurements are collected, interpretation of growth patterns is difficult because of the natural “faltering” in weight both shortly after birth and at the time of weaning.20 Further difficulties are related to gender differences in growth patterns and the effect of birth weight and gestation. Infants with lower birth weight tend to grow faster while larger infants grow more slowly, and it is of central importance21 to our findings that regression towards the mean was allowed for in the analysis. Regardless of when the weight observations were measured, the point estimates consistently showed a difference between the SIDS and controls that was more notable than observations taken at birth. Given the lower birth weight of SIDS infants and therefore the expected catch up growth, utilising growth reference charts further emphasised these differences. The importance of our results is that patterns of infant weight gain can now be seen in a new perspective relative to the infant's birth centile. This does not mean that poor weight gain by itself provides a sensitive marker for the risk of SIDS, but it does mean that there may be potential for intervention where poor weight gain is identified. Poor weight gain should be seen as a thread in the web of factors that render an infant vulnerable to SIDS and is both a consequence of adverse health and social conditions and a cause of poor health outcomes. Monitoring weight gain may be of particular importance among those families which are identified from other criteria as being at increased risk for SIDS, and provides a basis for generating both epidemiological and physiological research questions with important public health implications. These studies was supported by research grants from the National Advisory Body for the confidential enquiry into stillbirths and deaths in infancy (CESDI) and the Foundation for the Study of Infant Deaths (FSID). (1976) Sudden infant death syndrome. Am J Dis Child 130:1207–1210. Nicholl JP, O'Cathain A. Post-natal weight gain and the risk of sudden infant death syndrome. A report to the Foundation for the Study of Infant Deaths. Sheffield, UK, April 1988..
(1990) Growth velocity before sudden infant death. Arch Dis Child 65:1315–1318. (1965) Reports on public health and medical subjects. No. 113. (HMSO, London). (1991) Evaluation of risk related intervention programme to reduce the rate of possibly preventable deaths. PhD Thesis (University of Southampton). (1990) Prospective study on the prevalence of sudden infant death and possible risk factors in Brussels: preliminary results (1987–1988). Eur J Pediatr 149:284–286. (1982) Sudden infant death in Copenhagen 1956–1971. Acta Paediatr Scand 71:183–189. (1994) Postnatal growth preceding sudden infant death syndrome. Pediatrics 94:456–461. (1996) Growth and the sudden infant death syndrome. Acta Paediatr 85:1284–1289. (1995) Conditional reference charts to assess weight gain in British infants. Arch Dis Child 73:8–16. (1996) Environment of infants during sleep and risk of sudden infant death syndrome: results of 1993–5 case-control study for confidential inquiry into stillbirths and deaths in infancy. BMJ 313:191–195. Leach CEA, Blair PP, Fleming PJ, Smith IJ, Ward Platt M, Berry J, Golding J. Sudden unexpected deaths in infancy: similarities and differences in the epidemiology of SIDS and explained deaths.Pediatrics 1999;in press..
(1999) Editorial. Unexplained deaths in infancy. Lancet 353:161. (1992) SAS technical report P-229, SAS/STAT software: changes and enhancements, release 6.07. (SAS Institute, Cary, NC). (1990) Statistical methods in medical research (Blackwell Scientific Publications, Oxford), 2nd edition..
(1976) Evidence of duration and type of illness in children found unexpectedly dead. Arch Dis Child 51:424–429. (1992) Differences in somatic and organ growth rates in infants who died of sudden infant death syndrome. J Perinat Med 20:183–188. (1990) Assessment of growth in sudden infant death syndrome. Neuroepidemiology 9:95–105. (1992) Saltation and stasis: a model of human growth. Science 258:801–803. (1997) Growth monitoring with the British 1990 growth reference. Arch Dis Child 76:47–49. The analysis of the CESDI growth data by Blair and his colleagues is very welcome. There has been long standing uncertainty as to whether the average weight gain of SIDS cases is normal or not. Their analysis strongly suggests that SIDS cases often fail to develop normally prenatally, postnatally, or both. The data presented in their fig 1 are in remarkable agreement with the findings reported by the Enquiry into sudden death in infancy 35 years ago.1-1 They found that 46% of cases had below average weight gain compared with 27% of controls. The new findings show 45% of cases below the 27th control centile for weight gain, a comparison largely independent of the chart used. Hall1-2 comments that the lack of impact of growth monitoring in the developed world may be due to incomplete coverage of children in families with multiple social and economic problems who might benefit most. In this CESDI study there were no weight data for 24% of the cases and 15% of the age matched controls. Only 37% of the cases and 41% of controls had been weighed within two weeks of death/interview. These data, like those of similar studies cited, are wide open to selection bias. This may account for the discrepancy between two of their findings. First that poor weight does not appear as a risk factor for infants with birth weight below the 16th centile. Second that SIDS infants with poorest growth tended to be those with a short gestational age; admitted to SCBU; multiple births; having young mothers and/or with families of lower socioeconomic status, all of which are associated with low birth weight. The latter finding confirms what others working in this field have long suspected, that infants with the poorest growth tend to be those at greatest risk. The importance of charting weights was brought home to the team working in Sheffield at an early stage following the death of a high risk infant who had been weighed regularly but whose weight had drifted far below the normal range without generating alarm. Kristiansson1-3 was the first to show how standard centile lines, which are cross sectional, might be formally used to monitor weight gain. This inspired the design of the Sheffield weight charts,1-4 with their channel lines for monitoring short term weight gain. They are simpler than Cole's conditional charts1-5 because they ignore regression to the mean which is trivial over short intervals. An evaluation of these charts found that significant weight loss rarely occurs in the absence of illness, although over 75% of childhood illnesses may not be associated with interruption of growth. Home visiting with weighing and charting was used in four effective risk related intervention programmes to prevent unexpected infant death in England,1-6 in West Virginia,1-7 and in a programme focused on very high risk infants.1-8 Weight monitoring was considered to have played an important role in the reduction in mortality in these studies. SIDS rates are now so low that risk related intervention to reduce SIDS rates are difficult to justify. However, the systems of identifying infants at high risk of possibly preventable death also identify a range of adverse conditions,1-10 including child abuse. Targeting such infants for weight monitoring at home, as tentatively suggested by Blair and his colleagues, may reduce the risk of SIDS but will also identify numerous other problems at a remedial stage. (1965) Enquiry into sudden death in infancy. Reports on Public Health and Medical Subjects, No. 113. (HMSO, London). (1996) Health of all children (Oxford University Press, Oxford), 3rd edition..
(1980) Low rate of weight gain in infancy and early childhood. MD Thesis (University of Gothenburg, Sweden). (1985) Apnoea monitors compared with weighing scales for siblings after cot death. Arch Dis Child 60:1055–1060. (1995) Conditional reference charts to assess weight gain in British infants. Arch Dis Child 75:8–16. (1988) Prevention of unexpected infant death. A review of risk-related interventions in six centres. Ann N Y Acad Sci 553:96–103. (1995) Reducing postneonatal mortality in West Virginia: a statewide intervention program targeting risk identified at and after birth. Am J Public Health 85:631–637. (1993) Evaluation of attempted prevention of unexpected infant death in very high-risk infants by planned health care. Acta Paediatr 82:83–86. (1998) Report on 5000 babies using the CONI (Care of Next Infant) programme. (Foundation for the Study of Infant Deaths, London). (1985) What else do SIDS risk prediction scores predict? Early Hum Dev 42:247–260.